Pawar mentions that since 2006, she has been associated and working with the international organisation Against Child Trafficking (ACT), Netherlands. 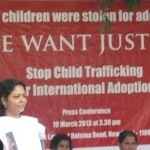 The organization’s prime focus is the prevention of child trafficking for inter-country adoption. ACT advocates child rights based social policies that are in compliance with the UN Convention on the Rights of the Child, which is the universal standard and the best safeguard against child trafficking. ACT is monitoring inter-country adoption practices worldwide and conducts research on child rights issues, particularly those that affect children deprived of parental care and trafficked children. In her capacity as consultant for ACT, Pawar has reunited several adoptees with their families and also assists families whose children were trafficked for adoption.